Does anybody actually like vodka? I’m not sure they do … it’s just searing alcohol to me, and before the whole of Eastern Europe rises as one and mercilessly hunts me down, I’ve found a way to make it a bit more palatable. To transform it into something worth drinking, rather than merely enduring, if you like. The miracle ingredient in this endeavour is a couple of sticks of rhubarb. Just that. Rhubarb. The stuff you normally stew to a mush and cover with crumble. It’s an interesting combination of flavours, with the harsh alcoholic edge intensified and made more complex by the tart sourness of rhubarb and mellowed down again with sugar. All you need is a couple of sticks of rhubarb, a bottle of vodka, a few things from the fridge and cupboard and about four months and you’ll be experiencing one of the best and most interesting flavoured spirits I’ve ever tasted. First of all, find a Kilner jar. A big one. Big enough to take a whole bottle of vodka and a clutch of other ingredients, with space for a little agitation. Sterilise the jar by putting it through a dishwasher cycle or heating in the oven a quarter of an hour. Given the fact that the core ingredient in this recipe is almost pure alcohol, this step might seem unnecessary, but better safe than sorry, eh? Chop a couple of sticks of rhubarb into one centimetre chunks and throw it all into the jar. The rhubarb needs three generous tablespoons of sugar to take the edge off, and you have a choice here – to keep the liquid relatively clear, use a white sugar, but if you want something different, use a light brown or light muscavado sugar to add a touch of nuttiness to the finished drink. That bottle up there has muscavado in it. Let the rhubarb and sugar mascerate overnight and then add a cinnamon stick, three cloves, and the zest of half a lemon. 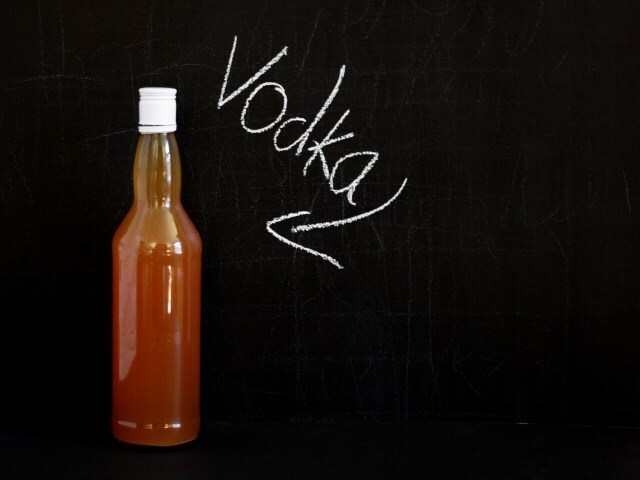 Pour a bottle of vodka into the jar, about a litre, seal it and give it a shake to mix. Continue to shake the jar every day for three weeks. Yes, same routine for THREE WEEKS. Keep shaking. After the three weeks of shaking and waiting, strain the vodka back into the bottle through muslin, screw the cap back on and stash it away for three whole months. I know, I know. Three months is an eternity, but it needs time to mature and for the flavours to develop properly. Just wait it out, OK? When it’s ready, use it like you’d use any other vodka, but remember that it’s particularly good neat, but not all at once. We will be making this for sure! You can count on it. This is an excellent recipe. I’ve decanted mine and bottled it up for Christmas though couldn’t resist a sample beforehand. Superb! Will be even better once it’s had a few months to mature. I couldn’t face throwing the vodka-soaked rhubarb away so I added 2 tablespoons of brown sugar to it, gave it a good shake and left it in the jar. After a week the sugar had extracted a lot of the liquor from the fruit. I drained this off and the result was a fruity alcoholic syrup, almost worthy of a liqueur. Next I’m going to reduce what’s left of the fruit to a jammy sauce and see what happens. Thanks for the inspiration Rich. Look how far it’s dragging an idea out.